I had intended to post this last week, the day after Thanksgiving, because of the gratefulness theme. But last week completely got away from me, so here we go. First Page/Spread: "We come to sing a song of praise to you, O God, the Lord of Heaven and Earth, who by your power and out of your love have created all things and called them good." 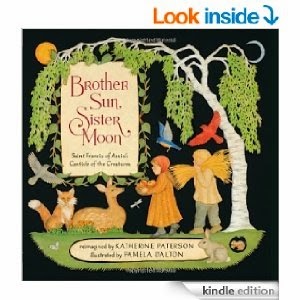 Synopsis: In Brother Sun, Sister Moon, award-winning author Katherine Paterson re-imagines a hymn of praise originally written by Saint Francis of Assisi in 1224. Illuminated with the exquisite illustrations of cut-paper artist Pamela Dalton, this picture book offers a stunningly beautiful tribute to nature. Resources: The original prayer/canticle is included in the back of the book to look at. There are some activities related to St. Francis of Assisi at this site. Most nature-related activities would also work, including looking through the gorgeous paper-cut illustrations for specific plants or animals. What a beautiful choice today. That cover really engages you so I imagine beautiful illustratioons. I also love the focus on nature! ALL the illustrations are beautiful like that cover - truly. I loved just about everything about this one - thanks for stopping by, Patricia! I remember seeing a movie years ago based on this story. What a gentle, peaceful book to reflect on during the Christmas season! Thanks so much, Jarm. I think I might have seen something about the movie when I was googling the book to get the cover pic. And who doesn't need peace this time of year. :) I appreciate you stopping by! I'm very much looking forward to reading this beautiful book - thanks for posting! It really is beautiful, Julie - thanks for stopping by. I'm sure you will enjoy it! Oo, it is lovely to see a new version of this. Thanks, Joanna. You're very welcome - thanks for stopping by! I really love the illustrations in this book! Quite unique! Thanks for sharing! You're very welcome - I love them too! Thanks for stopping by! I've always loved this story. The cover looks gorgeous. Thanks for reminding me about this story. You're quite welcome, Sue - I had never heard of it :) Thanks for stopping by! Lovely book and at just the right time of year too. Beautiful choice, thanks. It is lovely :) Thanks for stopping by, Diane! OH - I may have to pick up that middle grade and give it a look. Thanks for stopping by!